Description: CN #5703 and CN #5761 have just made the long haul up the escarpment from Bayview Junction into the Dundas Subdivision. Title: CN 2706, BC 4642 & CN 5761 head east through Ardrossan at MP 250 of CN's Wainwright Sub. 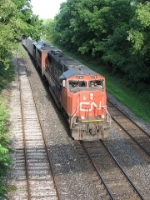 Description: CN's SORE 1 rolls into Partridge Yard. 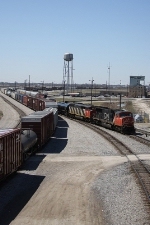 Description: CN Engines 5761 & 2506 leaving Partridge Yard with SORE 1 near Goose Lake Bridge. Description: The race is on who will win CN 5761 or its shadow? CN Engine 5761 races the setting sun as she leave Negaunee, Mi with a loaded SORE 1 near The Goose Lake Bridge. Description: CN's SORE 1 finds itself amid a beautiful winter scene, as it rolls over the Goose Lake Inlet on its way back to Escanaba, Mi. Description: CN 5761 Leads SORE1 out of Negaunee, Mi bound for Escanaba, Mi. Taken from Goose Lake Bridge. Description: This train passed the Mile 40 detector at 55mph. Normally, by my observations, trains run in the mid-30s.